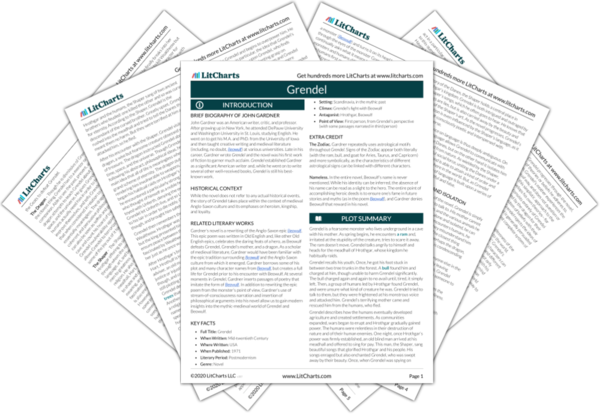 Instant downloads of all 946 LitChart PDFs (including Grendel). 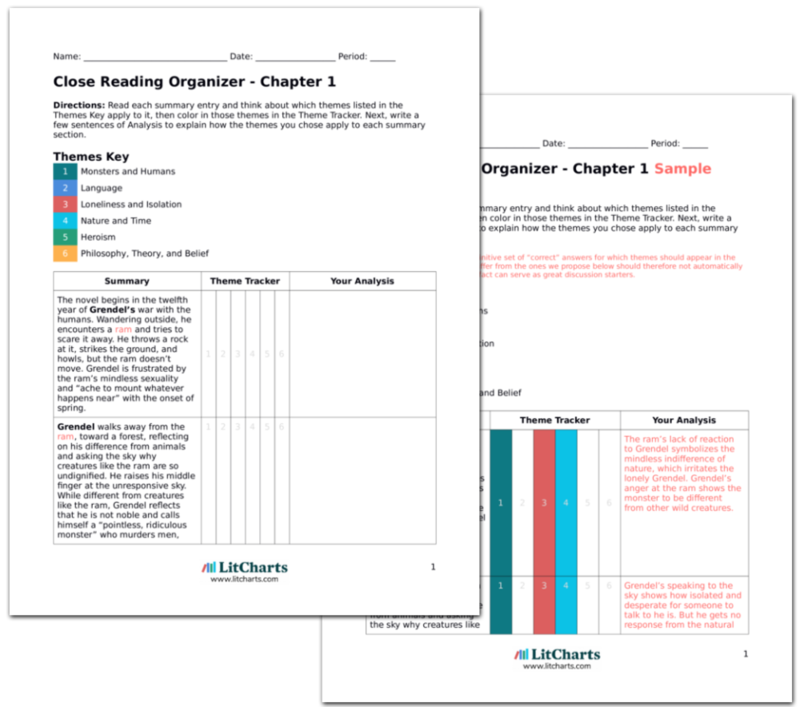 LitCharts assigns a color and icon to each theme in Grendel, which you can use to track the themes throughout the work. Grendel is profoundly bored and sick of the scent of the dragon that is around him, accompanying his protective charm. He watches a goat climb the rock cliffs near his lair. He shouts at the goat to leave but it keeps climbing mindlessly. He hurls a boulder at it, but it keeps climbing. Grendel is annoyed by the animal’s mindless stupidity. He rips up a tree and rolls the log down at the goat. The log trips the goat and Grendel pelts it with stones. The goat, bleeding and injured, still climbs on. Invulnerable to the humans’ attacks, Grendel is no longer as excited by his war with Hrothgar. Like the ram from the beginning of the novel, the goat symbolizes the indifference of nature, as it mindlessly propels itself toward its own death, not unlike how Grendel will soon go to his own death at the hands of Beowulf. At dusk, Grendel watches Hrothgar’s men going about their business. There are guards posted throughout the realm, though there is no danger. Grendel overhears a woman telling children that an extremely strong man will come from far away one day. Grendel eats some children who stay out after dark. As spring approaches, Grendel is still bored. The woman’s tale about a strong man foreshadows the arrival of Beowulf. As Hrothgar and his people have ceased to be a real rival or threat to Grendel, his life is again filled with boredom. The Shaper is sick. Grendel watches as Hrothgar, Wealtheow, and Hrothulf go to visit the Shaper’s sickbed. Grendel laughs, asking “Where are all his fine phrases now?” The Shaper dies. Grendel sees a messenger go announce the death to a woman the Shaper was particularly fond of. Grendel considers taking the woman, but thinks better of it. He watches men put coins on the Shaper’s closed eyelids, and then returns home. Grendel takes some pleasure in the death of the Shaper, pleased that his powerful language could not protect him from the passage of time. But, his desire to go see the Shaper (perhaps not so different from Hrothgar’s respectful visit to the dying man) suggests that he feels some kind of connection or relationship to him. Back in the cave, Grendel continues to feel bored. His mother begins to block the entrance to the cave, trying to stop Grendel from leaving. When they sleep, she buries him under her fur. Prompted by the death of the Shaper, Grendel ponders the impossibility of going back to the past and remembers his youth. Grendel takes the Shaper’s death as an opportunity to theorize about the past. As earlier, Grendel’s mother tries to express some kind of love or protective affection for Grendel, but Grendel sees it as smothering. 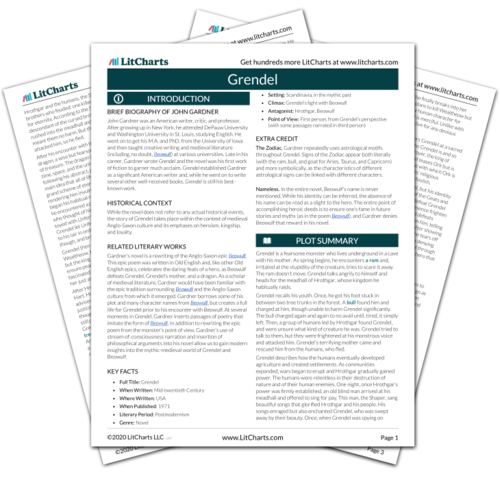 Get the entire Grendel LitChart as a printable PDF. Grendel decides to attend the Shaper’s funeral. His mother attempts to prevent him from leaving the cave. Grendel considers that she might know something he doesn’t. He pushes her aside and goes to the funeral, where the Shaper’s assistant sings. Men light the Shaper’s funeral pyre and priests say prayers. Grendel feels that it is the end of an epoch. Grendel’s desire to go to the Shaper’s funeral again suggests that he felt a strong connection to the man and, as much as he despised him, perhaps also admired him and his ability. Back in his lair, Grendel awakes from a deep sleep, imagining that he still hears the goat climbing up the cliff. He gets up and leaves the cave. He reflects that he should put off war with the humans until spring. The goat’s mindless persistence continues to haunt Grendel: is Grendel merely another creature of nature, progressing blindly toward his death? Fredericksen, Erik. "Grendel Chapter 10." LitCharts. LitCharts LLC, 16 Sep 2013. Web. 14 Feb 2019. Fredericksen, Erik. "Grendel Chapter 10." LitCharts LLC, September 16, 2013. Retrieved February 14, 2019. https://www.litcharts.com/lit/grendel/chapter-10.